Milonde is a community of 15000 people, spread over ten villages. It is a peasant farming community that sits at the foot of Mount Mulanje in South West Malawi. It has no electricity, no sanitation and water comes from hand pumps. The farmers grow Maize, the staple diet, along with onions, tomatoes and root vegetables. If the rains come, they eat. If the rains fail or come as floods, they starve. Spirit Aid has been working in partnership with the community since 2008. Our head of operations David Hayman, on his first visit, met with all the Chiefs of the ten villages and asked how Spirit Aid could, in partnership with the Community, help develop the resources that would improve the health, education and opportunities for the Young People of their villages. What follows is the result of that meeting. At the request of the ten Chiefs, we started a feeding programme for the pupils attending the High School. Higher Education in Malawi is not compulsory, or free, as pupils have to pay school fees of £18 per year. In a barter economy that is extremely difficult for most families and leads to many young people leaving school too early to achieve anything. Spirit Aid currently has around fifty scholarships to Milonde High School. We pay the school fees for families that cannot afford them. Many pupils have to walk up to two hours to reach school without having had a breakfast, followed by two hours walk home for the only meal of the day. We provided a lunch of Maize, Beans and Vegetables. The school role has gone from 280 pupils to 500. Pass marks have gone from an average of 12% to 96%. And over a period of three years, eleven graduates are now primary School teachers working in the area. Four have become Police officers, two Health and Welfare officers and one a Midwife. We have added new teacher houses and increased the number of staff. We have installed Solar Power in the school enabling pupils to study when night falls at 6 o’clock. Since we supplied computers, teachers and pupils are now being trained in IT skills. The girl’s dormitory has been improved with lights, windows and better security along with a new kitchen and washroom. Bunk beds were built, twenty-four of them. The girls now have much better living conditions and much-needed privacy. Milonde High School, regarded as a ‘Bush School’ in Malawi, is now the second highest performing school in the country. The Minister for Education visited the school last year to find out how the remarkable transformation came about, and it’s all down to Lunch! Spirit Aid has created nurseries in seven of the ten villages of Milonde. 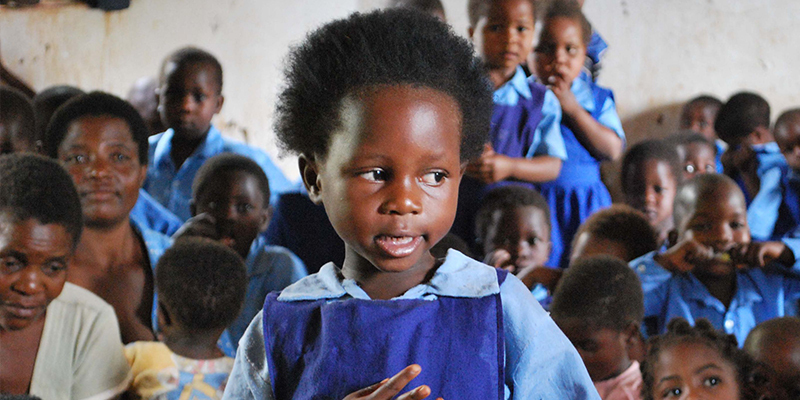 Each nursery has between 100-150 Children who are given lessons in Chichewa (the tribal language), English, arithmetic and the songs and dances of their culture. The children are given a bowl of porridge every morning. As Milonde is only separated from Mozambique by the river, many Mothers are bringing their children across the three bridges to attend our nurseries and be fed and educated. We opened 10 nurseries in Malawi. The women of Milonde came to David Hayman and said ‘We want to work’. ‘We need to work, can you help us?’. The women wanted to make industrial clothing and school uniforms using manual sewing and knitting machines. Spirit Aid provided the first four machines, materials and an instructor to train the first six women. The Women then trained the next six. There are currently thirty-six women trained to make clothing with the machines. There is a waiting list of about sixty more. The produce from the group enables the women to earn a wage and provide for their families, even in times of crop failure. With self-belief and confidence, these hard-working women have got their dignity back. Water pumps are installed, initially by the Government, but when they break down or need maintenance then the community bears the cost and responsibility. The bills can sometimes be as high as hundreds of pounds, prohibitive for the community. Spirit Aid has replaced or repaired seven water pumps. At several times during our partnership, the community has been hit by severe floods or droughts. For example, in early 2015 torrential rain fell for days flooding the area and destroyed over a hundred homes. The community was cut off from the markets, shops and hospital which are a seven kilometres walk away. We instantly set up emergency centres in the solid brick buildings in the area, including schools and churches as most buildings and homes are made from earth bricks that have no resistance to flooding. We supplied food, water, blankets, medicine and support while we rebuilt the houses and repaired the damage. We transported the injured to hospital. A few years ago we started up several football teams and inaugurated a Milonde Spirit Aid Cup. The tournament has been an enormous success and each year the final plays to over 3,000 people. There are eight teams, four of whom we have supplied with football tops. The players play in bare feet. There are probably only six pairs of football boots among a hundred players. Next year we hope to start a Netball tournament, hopefully with four to six teams. Milonde High School is desperate to have a dedicated Science/Tech/IT Lab. It will be an extension to the side wall of a classroom that will house benches, solar power points, instruments & containers for science lessons and computers for IT studies. Additionally, the school would benefit enormously from a connection to the internet that would enable much more advanced teaching and access to the invaluable knowledge that can be sourced through the web. Currently, the only internet signal is seven kilometres away. The young people in the community need somewhere they can call their own like a youth centre or meeting place. We were in the process of building a youth centre which was being fitted out with lighting, computers, educational aids, sports equipment and games. Unfortunately, during its construction, a violent storm hit Milonde killing one of our team of workers and injuring many more. It damaged dozens of homes and reduced to rubble our nearly completed centre. When we have the funds we will create a youth centre. Thanks to your support we are the guerrilla aids, reaching out communities that no-one else would help! Help us to continue our work in Malawi by making a donation towards our target. Any donations, no matter how small, will enable us to continue our work on the ground in Milonde.